All original documents requiring attestation should be first valid by the designated agencies in the State from where the document has been issued. In case of personal documents, Home Department /General Administration Department are the designated establishments. In case of educational documents, the documents should initial be valid by the Education Department of the concerned State Government/Union Territory. 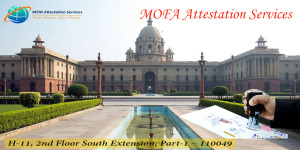 The Ministry of External Affairs attests the documents on the foundation of the signature of the designated validation authorities of the State Government/Union Territory/Chambers of Commerce; hence it does not take responsibility of the contents of the documents.